New fossil proves that evolution forgot to evolve – again! The more we find of fossil forms, the more evidence amasses that nothing has ever evolved. 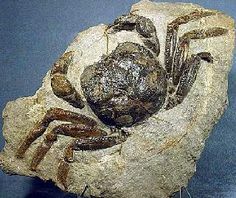 A new article entitled, “Tiny new fossil helps rewrite crab evolution, sheds lights on late Jurassic marine world,” one more discovery that life forms have not changed is added to this list. Ironically the title has nothing to do with the evidence. No rewrite of crab evolution. No light shed on late Jurassic marine world. Nothing learned except that nothing has evolved. One researcher has this to say, “It’s amazing, but if we did not know this was a 150-million-year-old fossil, we might think that it came from today’s ocean,” Dr. Martin said. “This came as quite a surprise to all of us.” But this is not surprising for those of us who read about the fossils found in every “geologic age” and in every place on the planet. Nothing is intermediate. Nothing has evolved. Only in the mind of the conjuror does evolution have a playing field. And so it goes. Great science is resisted for myth and magic.